We offer genuine homemade Italian fare at reasonable prices. We prepare all of our meal options fresh, using only the finest ingredients. 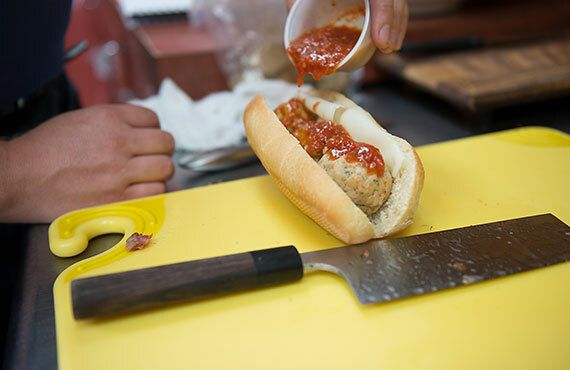 We make meatballs every Wednesday and almost always have them ready and waiting for you to take home! Available Thursday and Friday only! We make fresh margherita pizzas ready for you to take home for dinner - great for entertaining! Our shells come in packs of 6 - the perfect size for 2-3 people! We can cater any size event up to 100 people. Our professional catering team allows us to provide you with the freshest catered fare possible. While we offer several standard options, we can also provide a customized menu for you and your guests. And we invite you to sample our food before you book so that you can ensure you’re satisfied with your choice. What kind of catering menus do you offer? We have a selection of sandwiches, salads and pasta dishes available for any size group! Generally it starts with a discussion. We learn about your event, your tastes, your guests’ preferences, and then we work together to create a menu that works just for you. Alternately, you can conveniently select from one of our prepared menus sure to make your event a hit. From $8.00 - $38.00 per person depending on the style of the event, and the catering equipment required. Visit our contact page, email us at ciao@soffritto.ca or call us at 403-278-2728. Ask for Gord We’ll get you set up. "We ordered Soffritto's beef brisket for a bachelor party with around 25 guys, it was an absolute hit! Thank you so much."